Low Cut Filter: 18-60Hz with bypass option. Low Frequency BP EQ: 15-500Hz, Boost/Cut +- 15dB, wide Q 0.1 – 0.9. Low-Mid Frequency BP EQ: 200Hz-3kHz, Boost/Cut +- 15dB, wide Q 0.1 – 0.9. Mid-High Frequency BP EQ: 700Hz-12kHz, Boost/Cut +- 15dB, wide Q 0.1 – 0.9. High Frequency BP EQ: 15kHz-21kHz, Boost/Cut +- 15dB, wide Q 0.1 – 0.9. EQ Bypass on/off and preset manager with 12 example presets. 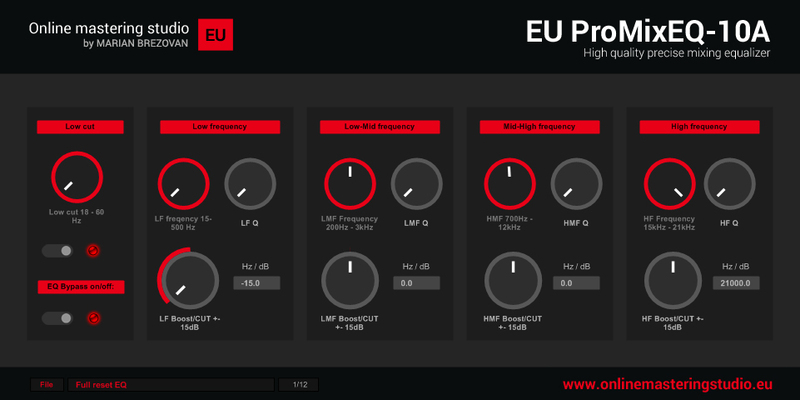 EU ProMixEQ-10A is released as freeware for Windows and can be downloaded here.